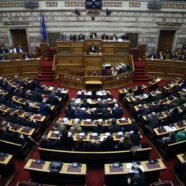 (ATHENS, Greece) — Greece’s parliament has approved a measure for Macedonia to join NATO, ending a decades-old dispute. The Greek vote means the former Yugoslav republic will now formally change its name to North Macedonia, settling a dispute of the country’s name which Greece’s saw as a potential threat to its own northern region of Macedonia. Greek opposition parties said the agreement made too many concessions to Macedonia.